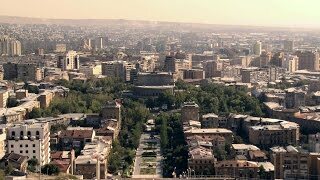 N 40° 10' 51" and E 44° 30' 48"
Yerevan in Yerevan with it's 1,093,485 citizens is a city in Armenia. It's the capital of this country. Local time in Yerevan is now 11:22 PM (Monday). The local timezone is named Asia / Yerevan with an UTC offset of 4 hours. We know of 9 airports in the vicinity of Yerevan, of which 3 are larger airports. The closest airport in Armenia is Zvartnots International Airport in a distance of 7 mi (or 11 km), West. Besides the airports, there are other travel options available (check left side). There are several Unesco world heritage sites nearby. The closest heritage site in Armenia is Cathedral and Churches of Echmiatsin and the Archaeological Site of Zvartnots in a distance of 12 mi (or 19 km), West. Looking for a place to stay? we compiled a list of available hotels close to the map centre further down the page. When in this area, you might want to pay a visit to some of the following locations: Ashtarak, Artashat, Aralik, Tasburun and Hrazdan. To further explore this place, just scroll down and browse the available info. Let's start with some photos from the area. 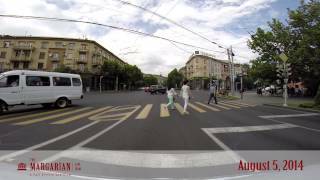 Driving through the streets of Yerevan. Video on the GoPro Hero3+ Action Camera. Make sure to turn the resolution to 1080-HD before viewing. More coming soon. "Yerevan in Motion" by Arsen Matevossian. Bright Colors Of Armenia's Capital Yerevan! Enjoy the Mood. Yerevan is the capital and largest city of Armenia and one of the world's oldest continuously inhabited cities. Situated along the Hrazdan River, Yerevan is the administrative, cultural, and industrial center of the country. 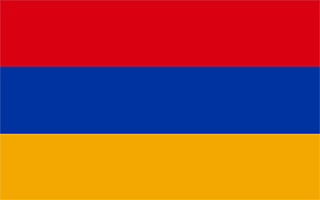 It has been the capital since 1918, the thirteenth in the history of Armenia. The history of Yerevan dates back to the 8th century BC, with the founding of the fortress of Erebuni in 782 BC by king Argishti I at the western extreme of the Ararat plain. Located at 40.1833, 44.5167 (Lat. / Lng. ), about 0 miles away. The Football Federation of Armenia (FFA) (Armenian: Հայաստանի ֆուտբոլի ֆեդերացիա) is the governing body of football in Armenia. It organizes the football league, Armenian Premier League, Armenian national football team, and the Armenia women's national football team. It is based in Yerevan. The FFA was awarded a synthetic football turf pitch by FIFA through its GOAL programme. Located at 40.1763, 44.5211 (Lat. / Lng. ), about 1 miles away. The National Assembly (Armenian: Ազգային Ժողով, Azgayin Zhoghov) is the legislative branch of the government of Armenia. Located at 40.1899, 44.5091 (Lat. / Lng. ), about 1 miles away. The Central Bank of Armenia (Armenian: Հայաստանի Կենտրոնական Բանկ) is the central bank of Armenia with its headquarters in Yerevan. The CBA is an independent institution responsible for issuing all banknotes and coins in the country, overseeing and regulating the banking sector and keeping the government's currency reserves. The CBA is also the sole owner of the Armenian Mint. The bank is engaged in policies to promote financial inclusion and is a member of the Alliance for Financial Inclusion. Located at 40.1759, 44.5106 (Lat. / Lng. ), about 0 miles away. Yerevan State Linguistic University after Valery Brusov (YSLU) is a university in Yerevan, Armenia, which trains specialists in Russian, English, French, German, Greek, Spanish languages, practical psychology, history, political science, area studies and other humanities. Located at 40.1874, 44.5107 (Lat. / Lng. ), about 0 miles away. The 1999 Armenian parliament shooting (Armenian: Ազգային ժողովի ահաբեկչություն literally National Assembly terrorist attack); also known as October 27 (Հոկտեմբերի 27) was an attack on the Armenian National Assembly in the capital Yerevan on October 27, 1999 at 5:15 p. m, by a group of armed men led by Nairi Hunanyan that killed Prime Minister Vazgen Sargsyan, Speaker of Parliament Karen Demirchyan, 5 other high-ranking officials and one journalist. Located at 40.19, 44.5092 (Lat. / Lng. ), about 1 miles away. Yerevan State Musical Conservatory (YSC) or Yerevan Komitas State Conservatory, (Armenian: Կոմիտասի անվան Երեվանի Պետական Երաժշտական Կոնսերվատորիա) is a conservatory located in Yerevan, Armenia. It was founded in 1921 as a music studio, and re-founded two years later as a higher musical education institution. Located at 40.1871, 44.5169 (Lat. / Lng. ), about 0 miles away. Republic Square (Armenian: Հանրապետության հրապարակ Hanrapetu'tyan hraparak, formerly Lenin Square is the large central town square in Yerevan, Armenia. The square is intersected by the following streets: Abovian, Nalbandian, Tigran Mets Avenue, Vazgen Sargsyan and Amiryan. The oval shaped square has a stone pattern in the centre, meant to look like a traditional Armenian rug from above. Located at 40.1775, 44.5126 (Lat. / Lng. ), about 0 miles away. Located at 40.1842, 44.5247 (Lat. / Lng. ), about 1 miles away. The Armenian Revolutionary Federation History Museum is a museum in Yerevan, Armenia, that displays the history of the ARF and of its notable members. The museum initially opened in 1946 in Paris, France and throughout the years, accumulated as many as 3,000 artifacts. The Museum was inaugurated in Yerevan during an official ceremony on July 13, 2007 at the Kristapor Mikaelian Center. Dashnak leaders such as Hrant Markarian and supporters were present at the opening. Located at 40.1758, 44.5144 (Lat. / Lng. ), about 0 miles away. Armenian National Academic Theatre of Opera and Ballet after Alexander Spendiarian (Armenian: Ալեքսանդր Սպենդիարյանի անվան օպերայի և բալետի ազգային ակադեմիական թատրոն) in Yerevan was officially opened on 20 January 1933. The building was designed by the Armenian architect Alexander Tamanian. The building consists of two concert halls: Aram Khatchaturian concert hall and the hall of the Alexander Spendiarian Opera and Ballet National Theatre. Located at 40.1858, 44.515 (Lat. / Lng. ), about 0 miles away. Kentron (Armenian: Կենտրոն, meaning "center") is a district of Yerevan, the capital of Armenia. It comprises the downtown, the commercial centre of the city. As of the 2011 estimate, the district has a population of 131,000. It is bordered by Ajapnyak and Malatia-Sebastia districts from the west, Shengavit and Erebuni districts from the south, Nor Nork district from the east and Arabkir and Kanaker-Zeytun districts from the north. Hrazdan River flows through the western part of the district. Located at 40.1781, 44.5131 (Lat. / Lng. ), about 0 miles away. Sundukyan State Academic Theatre of Yerevan, founded in 1922, is the oldest modern theatre in Armenia. Well-known actors and directors such as Vardan Ajemian, Valentin Podpomogov, Vahram Papazian, Hrachia Ghaplanyan, Hrachya Nersisian, Hasmik, Avet Avetisian, Arus Voskanian, Edgar Elbakyan were the stars of teatre's group. Located at 40.1734, 44.5073 (Lat. / Lng. ), about 1 miles away. CJSIC Ingo Armenia (Russian: ЗСАО «Инго Армения») is one of the major insurance companies of Armenia, Closed joint-stock insurance company. Headquartered in Yerevan, Armenia. The Company was established in 1997 as “EFES” Insurance CJSC. On December 2003, the major part of the Company’s shares was purchased by “Ingosstrah” Russian Insurance CJSC, afterwards the Company was renamed into “INGO ARMENIA” Insurance CJSC. Located at 40.1769, 44.5205 (Lat. / Lng. ), about 0 miles away. The Aram Khachaturian House-Museum (Armenian: Արամ Խաչատրյանի Տուն-Թանգարան) opened in Yerevan, Armenia in 1982 and is devoted to the exhibition of the Armenian composer’s personal artifacts, as well as to the research and study of his creative output. Since the idea of the museum came about in the 1970s, Khachaturian himself was actively involved in its design. In fact, the composer left his manuscripts, letters, his piano, various memorabilia and personal gifts to the institution in his will. Located at 40.1902, 44.5134 (Lat. / Lng. ), about 1 miles away. 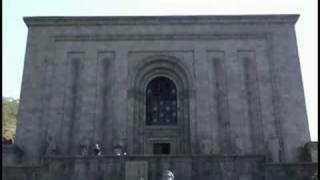 The History Museum of Armenia (Armenian: Հայաստանի Պատմության Թանգարան) is the national museum of Armenia founded in 1919 as Ethnographic-Anthropological Museum-Library. It is located on the Republic Square in Yerevan. Located at 40.1787, 44.5142 (Lat. / Lng. ), about 0 miles away. The Yerevan History Museum (Armenian: Երևանի Պատմության Թանգարան) is the history museum of Yerevan, the capital city of Armenia. The museum was founded in 1931 as the Communal Museum. It is located in the Yerevan City Hall. The architect of the building was Jim Torosyan. Located at 40.1747, 44.5043 (Lat. / Lng. ), about 1 miles away. Hakob Paronyan Musical Comedy Theatre of Yerevan, is one of the prominent theatres of the Armenian capital of Yerevan, founded in 1941. 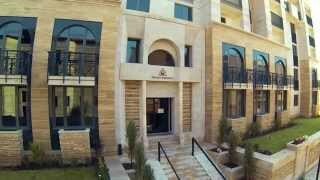 It is located on Vazgen Sargsyan Street in the central Kentron district of the city, near the Republic Square. Located at 40.1772, 44.5108 (Lat. / Lng. ), about 0 miles away. The Civilitas Foundation is an Armenian non-profit organization based in Yerevan, Armenia, and established in October 2008 by Armenia's former Minister of Foreign Affairs, Vartan Oskanian. It is a development agency and think tank directed by Salpi Ghazarian that works to strengthen civil society, promote democracy, economic development and education in Armenia, and facilitate dialogue between Armenia and the international community on a number of pertinent political issues. Located at 40.1837, 44.5152 (Lat. / Lng. ), about 0 miles away. 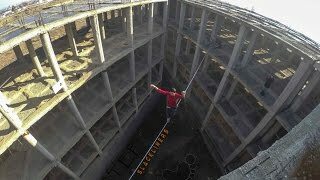 Armenian State Institute of Physical Culture (ASIPC) is a high-education institute, located in Yerevan, Armenia. It was founded in 1945 and prepares trainers, sports journalists, specialists in kinesiology and adaptive physical training. The graduates are awarded a diploma, which is a state-authorized document asserting the higher education completion for state agencies. Located at 40.1761, 44.5239 (Lat. / Lng. ), about 1 miles away. Freedom Square or Liberty Square (Armenian: Ազատության հրապարակ Azatut'yan hraparak), formerly Theatre Square (Armenian: Թատերական հրապարակ T'aterakan hraparak, Russian: Театральная площадь Teatral'naya ploshchad), also known as Opera Square (Armenian: Օպերայի հրապարակ Operayi hraparak) is a town square located in the Kentron district of the Armenia capital Yerevan. The Cascade is a giant stairway in Yerevan, Armenia. It links the downtown Kentron area of Yerevan with the Monument neighborhood. Inside the Cascade, underneath the exterior steps is an escalator going the length of the complex. There are also rooms connected to some of the landings along the escalators which comprise the Cafesjian Museum of Art. The exterior of Cascade, in addition to stairs has multiple levels with fountains and sculptures. Located at 40.1911, 44.5156 (Lat. / Lng. ), about 1 miles away. Mashtots Park Movement (Armenian: Մաշտոցի պուրակի շարժում), also known as #SaveMashtotsPark and OccupyMashtots began as a sit-in on February 11, 2012 in Mashtots Park, Yerevan. The protest was initiated by "This City Belongs to Us" civic initiative, and grew into a full-scale movement. Located at 40.1819, 44.5097 (Lat. / Lng. ), about 0 miles away. Officially State Russian Dramatic Theatre named after Konstantin Stanislavski, more commonly Stanislavski Russian Theatre, is a state theatre in the Armenian capital of Yerevan located on Abovyan Street in the central Kentron district of the city, next to Charles Aznavour Square. It was opened in 1937 and named after the Russian actor and theatre director Constantin Stanislavski since 1938. The theatre director is Alexander Grigoryan since 1965. Located at 40.1819, 44.5167 (Lat. / Lng. ), about 0 miles away. Yerevan Chess House (Armenian: Տիգրան Պետրոսյանի Անվան Շախմատիստի Կենտրոնական Տուն) is the centre of chess sport in Yerevan, Armenia, opened in 1970 and named after the former world chess champion Tigran Petrosian since 1984. The architect of the triangular-shaped building was Zhanna Meshcheryakova. Tigran Petrosian laid the first stone in the foundation of the building. Its official name is the Central House of Chess-player named after Tigran Petrosian. Located at 40.1804, 44.5243 (Lat. / Lng. ), about 1 miles away. These districts belong to Yerevan. These are districts that are close by, but belong to a different city than Yerevan. These are some bigger and more relevant cities in the wider vivinity of Yerevan. These are the most popular locations in Armenia on Tripmondo. Sargsyan A. Ev Kojoyan H.